Edouard Baer, Gerard Depardieu, Catherine Deneuve, Fabrice Lucchini, Valerie Lemercier, Danny Boon. 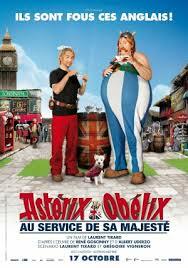 Asterix and Obelix have been popular for many decades. Appearing in comic strip form, their adventures were expanded into comic books. The next step was animated film versions of the stories. In the 1990s, there was a life-action version, which proved very popular. This is the third sequel. The main common denominator is the rotund Gerard Depardieu, dressed and made to look like the cartoon Obelix. The basic idea behind this story is very amusing, the rivalry and clashes between the English and the French. After Caesar has conquered Gaul, he decides to conquer Britain. However, he finds the British very hard to deal with. Caesar is played by the top French actor, Fabrice Lucchini. There are quite a lot of English characters in the film and they all speak with a very Anglicised French accent, including Catherine Deneuve as the Queen, modelled on Queen Elizabeth herself, her look and manner, clothes, but with small poodles. The British enlist the aid of Asterix and his special potion which gives enormous strength to people and will enable the British to defeat Caesar. There are various adventures along the way, including the potion being stolen. This leads to a fair amount of subterfuge and the soldiers having to use their own strength to defeat the Romans. An added bonus is the presentation of life in London, modelled very much on images of the 18th century, clothes, shops, manners. And there is also a presentation of the British upper-class. Always humorous, this is often a laugh-aloud comedy. 1. The popularity of the comics? The French animated versions? The live-action versions? 2. The success of the live-action films, layouts and creativity, locations, the characters and their look of the cartoon designs, parodies, situations and actions? 3. The title, relationships between Britain and France, humorous perspectives? The clashes? Caesar’s invasion of Gaul? The history? Caesar invading Britannia? Intentions? Being thwarted? His disdain for the British? The irony of Asterix and his friends being called to the aid of Britannia? 4. The humour in the names? the humour and the British characters and their British French accents? Including the Queen? The comparison with Queen Elizabeth? The look of Britain, the traditions, hot water and the introduction of Indian tea, the shops, the upper classes? The Queen and her assistant going to call to enlist the aid of Asterix? 5. Caesar, the parody, his vanity, his assistants, the soldiers, the invasion, the setting up of camp, lavish? His plan, the attack, his supervising the battle, the soldiers and their military formations, the Gauls and their power? Defeat? 6. Britain, the Queen, Catherine Deneuve and her impersonation of Queen Elizabeth? The little dogs? The manner, the Knights and their titles, the emissary, his reports? 7. The message to the Gauls, audience familiarity with Asterix and Obelix? Their village, Asterix in charge of Obelix and his humour? The English plea? The decision to go, Obelix not invited? His going nonetheless? 8. The special potion, carrying it to Britannia, Asterix and his friendship, telling the truth to Obelix, Obelix being hurt, Obelix not being attracted to women? Courting women – and failing? 9. The contemporary humour with the refugee, Indian, his help, his introduction of tea? 10. The potion and its effect, its stolen, search, recovering it, the reality of its power and effect? The pretence and its success? The fighters using their own strength? 11.	the humour of the picture of life in Britain, the 18th century style, the manners, the visit to the upper-class, a heroine, the tutor, the romance with Obelix? 12. The battles and the visuals? 13. The humour, the quips, the funny lines, satire, parody? An entertaining and happy experience?